We are starting a new year and ahead of us we have new goals and challenges portrayed in the FMUL Activity Plan for 2019, unanimously approved by the School Council, last November 29th. 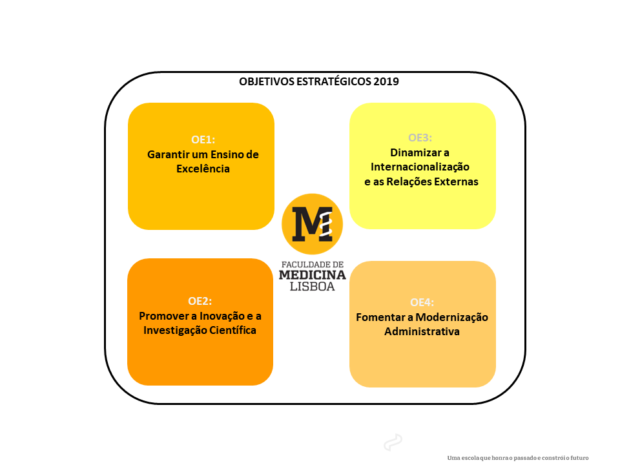 We believe that the strategic and operational objectives defined for 2019 and aligned with the main guidelines issued by ULisboa will allow placing the FMUL in a competitive position at the national and international level. The strategy to achieve this goal requires our school to provide a quality education, combined with excellent research and a practice of medicine at the highest level of scientific and technological development, to assert itself as a modern, innovative and open institution, with the ability to communicate and strengthen relations at various levels of society in an increasingly global environment. Much of what we aspire to depends on structural changes, especially in the context of the educational, scientific and health policy. However, it is our obligation to continue to create the conditions for the development of a modern Academic Medicine, adjusted to the challenges of the present and the future, which places us at the level of excellence that we all aspire to. So, we believe that throughout this year, with the enthusiasm and commitment of all the students, researchers, teaching and non-teaching staff, we will continue to build a School that honours the past and builds the future!